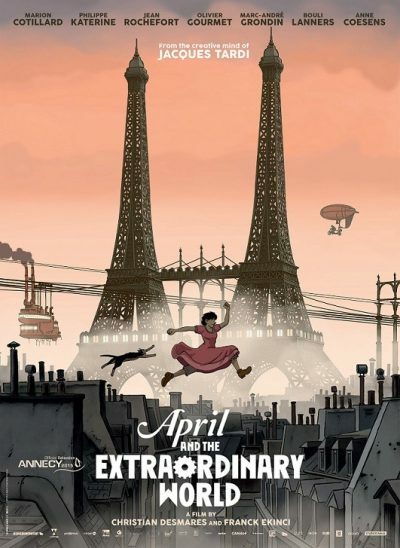 This French(ish – it was also a co-production with Belgium and Canada) animated feature is set in an alternate, thoroughly steampunk-y universe. A couple of lengthy prologues, occupying the first 20 minutes, set the scene. First, in 1870, Emperor Napoleon III is killed in an explosion at a secret research project attempting to create indestructible soldiers (something scurries away from the scene). As a result, the Franco-Prussian war never happens, and Europe goes along a different route. But simultaneously, scientists are being kidnapped, so electricity is never developed, and steam remains the power source of choice. Sixty years later, the remaining researchers have been co-opted to work for the government. “Free” husband and wife scientists Paul and Annette Franklin are working on an invulnerability serum, but are raided by the police; in the ensuing chase, a mysterious dark cloud appears to kill them, their father, Prosper (Robinow) vanishes, and their young daughter, April is left an orphan, to fend for herself, unaware her snowglobe, the sole momento of her parents, contains their final version of the serum. 10 further years on, the story actually starts. April (Galuppo) is quietly continuing her parents’ work, with the help of Darwin (Hale), a cat who talks due to a previous experiment. He is accidentally brought into content with the snowglobe’s contents, and becomes a sprightly new kitten. However, the cops are still watching her, in particular paid snitch, Julius (Fennell), but April is saved this time by a message from her father, delivered through a robotic rat. She escapes, with Julius in tow, and sets off to discover the truth about what happened to her parents, before the authorities can take the invulnerability serum and turn it to military ends. Damn. That’s three hundred words of synopsis, stripped down as much as possible, and still only covers about one-third of the film. Which should give you some idea of how densely packed with ideas this universe is. I certainly found myself wishing it had told us more about how we got from the fork in the historical road, to a world where there’s a cable-car running from one of two Eiffel Towers in Paris, all the way to Berlin. But there’s still plenty to appreciate going forward, as April finds out there’s a lot more going on in – or, perhaps, beneath – the world than meets the eye. There’s definite hints of Jules Verne here, but it reminded me most of Nadia: the Secret of Blue Water, a Japanese animated TV series of the early nineties, also Verne-inspired. It feels like something Luc Besson could have had a hand in. 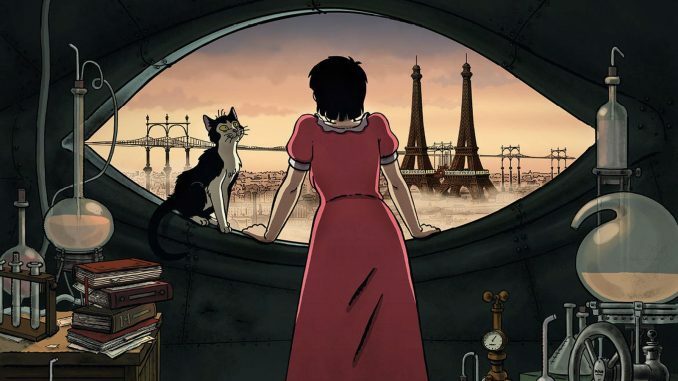 That might just be the “big SF world” concept here, but I wasn’t surprised to learn that Jacques Tardi, whose style was the inspiration here, also created the series adapted by Besson in The Extraordinary Adventures of Adèle Blanc-Sec. This is more overtly steam-punk, however, and the background does tend to be a bit of a mixed blessing: it distracts from the characters and story as much as it enhances, and as noted, especially early on, there’s a lot to follow. The talking cat is a bit much too, in a world otherwise grounded heavily in reality, though perhaps fits in better after you discover the truth about what’s happening. For technical reasons (my Roku wouldn’t change audio tracks), I ended up watching the version dubbed into English. Initially, I was clutching the arms of the sofa in preparation for this; however, turns out not be be too bad. It does seem to be aiming at a somewhat odd and narrow target audience: those young enough to need a talking animal, yet old enough to understand the concept of this as a different timeline, isn’t exactly mass appeal. However, if you are broad-minded enough to cover both bases, this is an impressive piece of imagination, with an appealing style, and a decent combination of brains and heart.